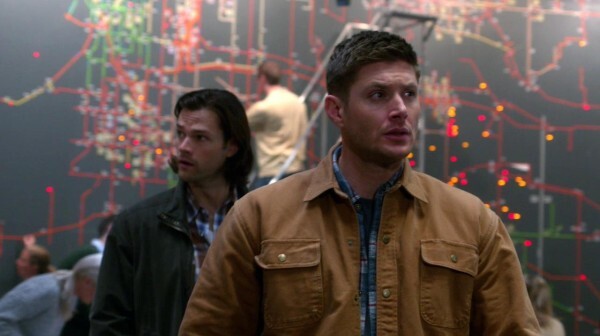 Crowley’s double-dealing, Cas is gearing up for war, and Dean’s about to self-destruct. All in a day’s work for the Supernatural crowd. With surprising deaths and hints at the darkness to come, we’re closing in on an exciting end of the season. When the introduction to any episode goes on for what feels like minutes, you know there’s going to be some big events happening. For this one, we had to be reminded of little details about Crowley and Abaddon and the First Blade because they’d all come into play. However, I wasn’t expecting some of the twists to happen just yet. This felt more like some finale plots rather than leading up to even more drama to come. First off, we see that Cas is growing an army. Perhaps to his advantage, this time he’s more organized and has a technological base that can watch his enemy’s every move. Not that it does as much good as some old-fashioned torture. 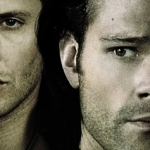 And who better to drill into a captured angel’s psyche than the Winchesters? Dean is almost giddy at the prospect of getting to use his skills to draw some blood and cause some pain. His willingness foreshadows his growing issues with the First Blade and the power of the Mark, but that’s something we’ll get into later. Cas has also got to deal with traitors in his midst. 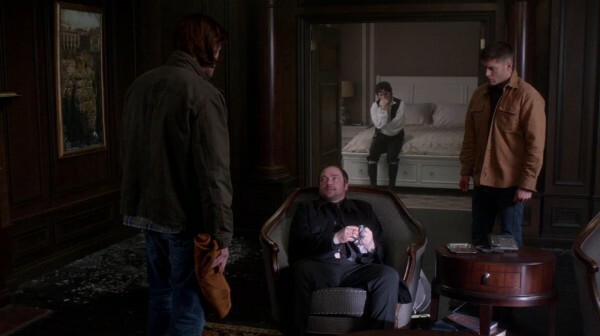 Someone came in and killed the captured angel after Dean and Sam cleared out. Who is it? And what problems might they cause in the final showdown between Cas and Metatron? Well, for Cas, if he’s going to have a mole in his camp, he wants to have a mole on the other side, too. His attempts to have Gadreel serve that role didn’t appear to be successful, but it was still being considered. I wonder if Gadreel will eventually comply and start feeding Cas information about Metatron’s plans, maybe even the location of the hidden portal back to Heaven. He seems to want to follow the true path, but he’s not sure which one that is yet. 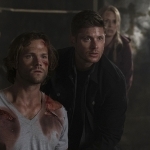 As Sam emphasized, despite Gadreel’s later actions of killing Kevin and other angels, he was never perceived as a threat while he was possessing Sam. The younger Winchester never felt like he was in danger, so is there some ultimate good in Gadreel after all? And with light comes darkness. 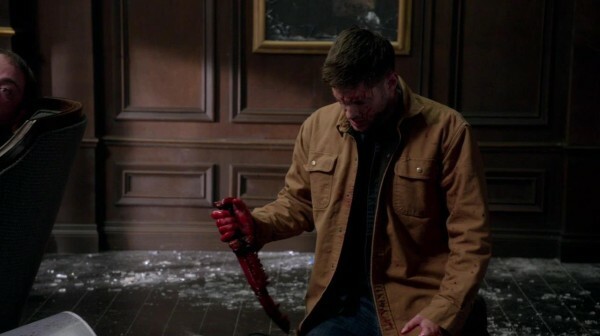 Dean is becoming more controlled by the Mark of Cain. The power that flows through him when he touches the blade rules his every thought. He’s possessed, there’s no other way to put it. If his former wandering thoughts and spacing out didn’t prove that, his actions during this episode certainly did. We all knew the plan. Get the blade, go kill Abaddon. But I’m not sure any of us were expecting it to happen prior to the finale. Dean was a man on a mission. 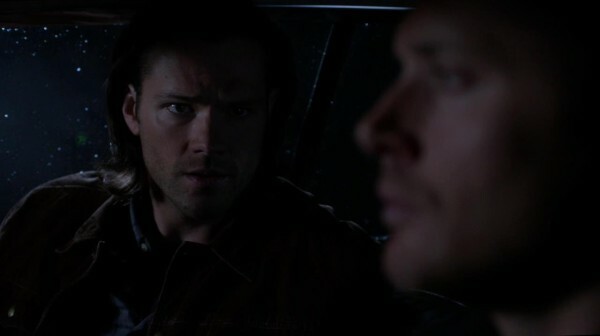 He lied to Sam to get him out of the way so that Dean could go in and face off with Abaddon alone, as he later admitted was always his destiny. And when taking out the Queen of Hell, he didn’t just stab her once as we’ve seen him do with prior demons. No, he slaughtered her by stabbing Abaddon multiple times until he was bathed in her blood. Only Sam’s pleas eventually broke him out of the trance he was in. But despite knowing how much control the blade has over him, he refuses to give it up. The power is changing him, making him something different. I just wonder if Dean will be able to come out of this battle with his humanity intact. Also, now we need to ponder the repercussions Gavin’s existence might have on the overall scheme of things. Crowley’s last shreds of humanity and his desire to see his son live may have just put everyone in danger. Gavin was supposed to die on the boat to America, but now that he’s time jumped and is going to be living in the modern world, what does that mean for the ripple effect? Will Crowley become a non-entity and Gavin rise to power as the new threat? It’s a possibility. Along with any number of outcomes for the angels, the demons, and the Winchesters. We’ve just got two more episodes to find out what will become of them all. Everyone will be changed, but who is going to come out of this alive?